Based at Glenview Community Church, Troop & Crew 156 has served its community for more than 50 years. 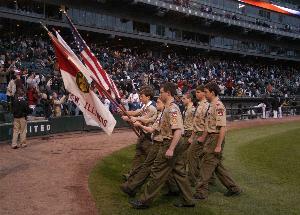 As one of the largest and most active Boy Scout units in Northeast Illinois, T-156 has a proud tradition of excellence. In the past five years the Troop has produced 20 Eagle Scouts. This is a "boy led" Troop with emphasis on developing leadership ability and other other important life skills and values. The patrol method is an important part of the program and outdoor adventures, service projects and special events are scheduled year-round. It's not uncommon to have as many as three different activities the boys can choose from each month. Troop 156 is also proud of it's diverse culture with many different races and religions represented. In addition to the traditional Boy Scout Troop, there is also a Venturing Crew for high school age men and women. Many of the "V-crew's" activities involve high adventure skills such as rock climbing or wilderness camping. Currently Mr. Paul Bauerschmidt serves as Scoutmaster, supported by a team of 35 trained adult volunteers serving as Committee Members and Assistant Scoutmasters. Mr. Mark Demsky is the unit's Committee Chair. Summer Camp final payments are due by May 2nd. Please turn in your checks to ASM Paul Schwarz at either of the next two Troop meetings. All Scouts attending Summer Camp each year receive a Class B t-shirt to wear while at Camp and during appropriate activities after camp ends. The designs on the front and back of the t-shirt are created by Scouts during our Summer Camp T-Shirt Design Contest, which kicks off now! Winning designs (one for the front, and one for the back) are provided to the t-shirt vendor, who have artists on staff to help flesh out even the simplest designs. The Riding Rampage Campout (May 10-12) takes us to the rolling hills of New Glarus, Wisconsin, to explore portions of the Badger State and Sugar River State bicycling trails, including the 1100 foot Stewart Tunnel. We'll camp at New Glarus Woods State Park, then hit the trails. Scouts will have a couple of distance options, and a SAG (support and gear) vehicle will be available to pick up anyone who just can't finish. Registration forms (attached) and fees are due by April 25th. All those going on the trip must bring their bikes and helmets to the Troop meeting on May 2nd for inspection, to make sure that they're ready for the trail. Questions? Contact trip leaders Bob Krause (rkrause2230@wowway.com) or Jeanne Barnas (jeanne.barnas@comcast.net). Please note that Troop meetings will now resume back at Glenview Community Church. For more info on this opportunity, contact trip leaders Jeanne Barnas at jeanne.barnas@comcast.net or Paul Schwarz at paul_schwarz@msn.com. Hey Ho Scouts (and parents, too). As thoughts turn to MaKaJaWan Worker Weekend – May 24-26 – and with summer camp coming up – Week 1, July 21-27 and Week 2, July 28-August 3, it seems appropriate to consider a few facts about Camp MaKaJaWan. According to the Camp MaKaJaWan website, the original 240 acres were purchased in 1928. East Camp opened a year later. West Camp (home of Troop 156’s North Camp campsite) opened in 1959 after Camp MaKaJaWan increased to its present 450 acres. Speaking of North Camp, it is the only campsite located on Lake Killian and is reached by crossing Skid’s Creek. OK, so enough history and geography. MaKaJaWan is really about fun – and lots of it. So, please don’t forget that final summer camp payments are due at the Troop meeting on April 25th and don’t forget to keep an eye out for the Worker Weekend flyer. At the last campout, I had two Scouts come up to me on Sunday morning and ask if I could charge their phones. The last campout was at Camp Oakarro which is about a 45 minute drive from Glenview. Even I know that devices can last much more than 45 minutes on a charge. All this suggested to me that the Scouts in question had been using their phones not just on the ride up, but at camp – a clear violation of Troop policy. Here’s the thing, Scouting has a lot to offer, but those opportunities will be missed by those Scouts who have their heads down looking at a phone. The Troop’s policy exists for a reason. Please respect your Scouting experience and leave your phone packed away when you are at camp. Q: What’s gray and stamps out forest fires? Gray: (1) Trending. (2) The color of the sky on a rainy day. (3) A mixture of black and white. (4) Dishwater at the beginning of the wash line. As in: The Scouts had done a nice job washing dishes. While the first wash bin was gray with all sorts of cooking scraps, the water in the last wash bin was clear as it had been doing its job sanitizing cookware that had been cleaned well.